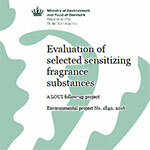 The project 'Evaluation of selected sensitising fragrance substances' was initiated by the Danish Environmental Protection Agency as a LOUS (List of Undesirable Substances) follow-up project. The objective of this study was to evaluate selected fragrance substances in relation to the classification criteria for strong sensitizers (Category 1A sensitizers) according to the CLP Regulation. As reminded in the Danish Environmental Protection Agency report, fragrances are widely used in many different types of consumer products. Therefore, the general population can be exposed to fragrances from many different sources and consequently can have a substantial exposure despite the fact that fragrances most often are used in a relatively low concentration in individual consumer products. Many fragrances have been shown to cause harmful effects to human health. Skin sensitisation (contact allergy) is identified as the critical effect for a wide range of fragrances. Many fragrances are already classified as skin sensitizers (Skin Sens Cat 1) according to the CLP Regulation. The CLP criteria for classification of skin sensitizers were revised in 2011 and now provide possibility for sub-categorising skin sensitizers in two sub-categories, sub-category 1A (strong sensitizers) or 1B (other skin sensitizers). Some of the fragrances that are already classified as skin sensitizers in Category 1 may possibly fulfil the CLP criteria for classification as strong sensitizers in sub-category 1A.